I know what you’re thinking. You think I’ve lost my mind and have just started throwing things together and eating them. You think I’m crazy for making a Tomato Mayonnaise Shrimp because those ingredients don’t sound like they go together at all, but you need to try this recipe before you knock it. Set aside your reservations for this recipe, and what the name sounds like, and make this Tomato Mayonnaise Shrimp. This shrimp is spicy and creamy and is really tasty. 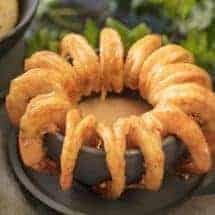 The sauce is the perfect blend of sweet and heat and marries with the shrimp really well. I love cooking shrimp in the Air Fryer. 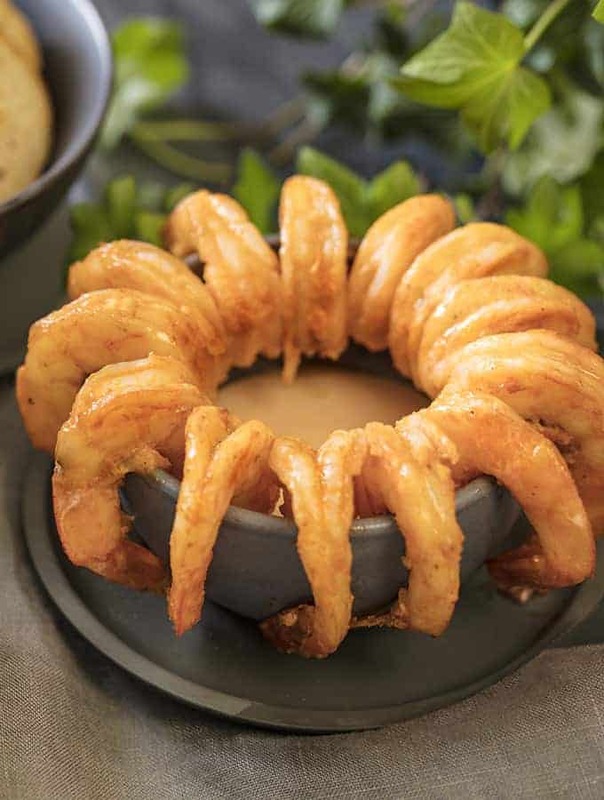 Shrimp cook quickly no matter how you cook them, but cooking them in the Air Fryer just seems to make them perfect. This entire dish will only take you about fifteen minutes from start to finish, so it the perfect appetizer. The bonus is, this is actually Keto and low-carb, so you can serve this to your guests whether they’re dieting or not! I love to create recipes that are Keto or low-carb, but that those who aren’t dieting would never know the difference. Good food should be just that, good food. And these Tomato Mayonnaise Shrimp are definitely good food. ENJOY THIS RECIPE AND LOOKING FOR MORE DELICIOUS SHRIMP RECIPES? CHECK OUT MY INSTANT POT SHRIMP WITH TOMATOES AND FETA! Tomato Mayonnaise Shrimp is so much more sophisticated-tasting than it sounds! 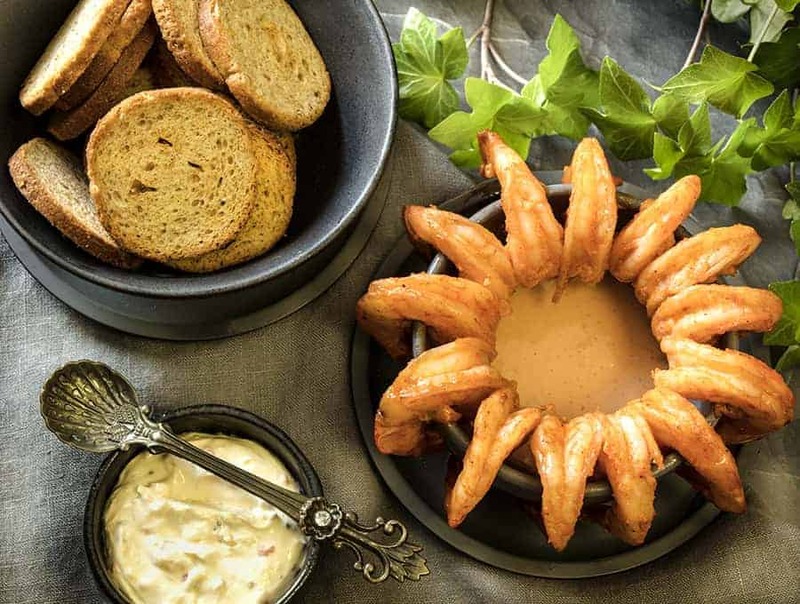 Combine some spice with creamy ingredients to make an amazing appetizer. In a medium bowl, mix together mayo, ketchup, garlic, sriracha, paprika, and salt. Add the shrimp and toss to coat with the sauce. 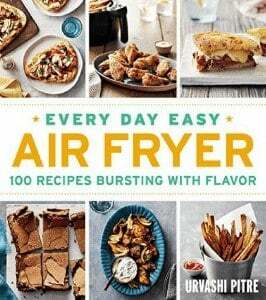 Spray the airfryer basket. Place the shrimp into the greased basket. Set airfryer to 325F for 8 minutes or until shrimp are cooked, tossing half way through and spraying with oil again. Sprinkle chopped onions before serving. What is the sauce you were serving it with? I used the same tomato mayo sauce as a dip. Just double it and save half to a use as a dip.